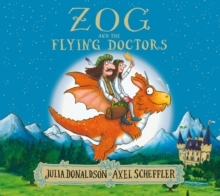 Meet the Flying Doctors: Princess Pearl, Sir Gadabout and, of course, their trusty 'air ambulance', Zog the dragon, in this fabulously original sequel to the bestselling ZOG, now available in paperback. There's much to do, as they fly around tending a sunburnt mermaid, a distressed unicorn and a sneezy lion. But should princesses really be doctors? Pearl's uncle, the King, doesn't think so - until he himself falls ill, and only Pearl knows how to curehim. This guaranteed bestseller from the creators of The Gruffalo and Stick Man shows Julia and Axel at their sparkling best.